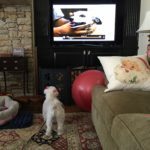 Some dog owners insist that their dogs attentively watch television, whereas other dog owners say that their dogs have no interest in television. Interestingly, there was a question whether dogs could even accurately see television images in the days of standard definition, because of the slower flicker fusion rate and the inferior resolution of older television sets. The flicker fusion rate is the refresh speed whereby a dynamic image appears stationary. The flicker fusion rate of a human or animal is related to the speed at which the retina and optic nerve update visual information to the brain. Think of flicker fusion metaphorically like the old motion pictures on cards or like the process of animation. The cards are separate still images that initially look non-contiguous. However, they appear like a real-time moving image when they are placed synchronously at high-speed, whereby they appear to fuse together. Old standard definition TV sets refreshed at a rate of 24 – 30 Hz (cycles per second). Humans can achieve flicker fusion at a rate of 16 to 20 Hz. However, dogs require a refresh rate of 70 – 80 Hz to see without any flicker effect. Birds require an even faster refresh rate of at least 100 Hz. Contemporary HD televisions usually refresh at a rate of 60 Hz and the most modern sets often refresh at a rate of 120 Hz. In addition, spatial resolution is an issue. Standard definition sets had a horizontal resolution of between 480 to 576 pixels. Modern HD televisions have a horizontal resolution of between 720 to 1080 pixels. The newest UHD (ultra-high definition) TVs have horizontal resolutions from 2160 to 4320 pixels. In addition to the number of pixels, the perceived visible resolution is also relative to the screen size, which is why an HD computer monitor often looks better up close than does a large television screen. Nevertheless, despite a larger screen size, the pixels per inch (PPI) is significantly more dense for the average HD television than for the average SD television. For instance, using display image specifications and Pythagorean calculations for area, the PPI for a typical 40-inch SD television was between 22 – 25 PPI, whereas the PPI for a 40-inch HD television is 55 PPI. Even a large HD screen of 60-inches has a PPI of 37, which is approximately 50% better than that of the SD televisions. The third relevant factor as to whether a dog can accurately see television images is the visual capability of the individual dog and the positioning of the dog relative to the television. Just like with people, some dogs see better than others. Moreover, given that a dog may be nearsighted or farsighted, the distance the dog places itself from the television may also be a factor in whether a dog accurately perceives a televised image. Mark employed a technique that included clicker conditioning, teaching a replacement behavior, leashing, response blocking, and aversive conditioning to modify Lili’s television animal “aggression.” First, Mark taught Lili that whenever she heard the clicker she would receive high-value food- lunch meat turkey. Lili during Stage 3. She has already learned to stop barking when an animal image appears on the television. In this photo she is staring, but not barking. Moments after, she came to Linda to receive a food reward. Second, once Lili routinely came toward Linda when hearing the clicker, Mark combined the clicker behavior with a DVR presentation of an animal show. During Stage 2, Mark leashed Lili and kept her near the threshold distance. The threshold distance was highly relevant, since Lili rarely barked outside the threshold distance, either because she could not accurately see the image or because she was otherwise insufficiently stimulated. Whenever the DVR program displayed an animal, using the leash Mark blocked Lili from moving closer to the television and if she moved closer he corrected her lightly to move her farther away. He then instructed Linda to click the clicker and to feed Lili when she came. The plan was to condition Lili that the presence of a televised animal image was a precursor stimulus that meant she would imminently be fed high-level food, but only if she moved away from the television set and toward Linda. Third, once Lili was regularly ignoring the televised animal image and instead coming to Linda for food without the inclusion of a physical response block or correction, the behavior modification plan progressed to a semi-off leash format, where Lili wore a leash that was dropped to the ground. During the semi-off leash stage, Mark added a squirt gun as an aversive conditioner. The role of the squirt gun was to startle Lili and create braking behavior. Braking is an inhibitory control operation where the anterior cingulate gyrus and prefrontal cortex interfere with impulsive behavioral activity to create a calmer state and the inclusion of executive management and cognitive areas of the brain in the selection of behavioral options. If Lili came on her own, Linda clicked and fed. If Lili hesitated, Linda clicked, then fed when Lili came. If Lili barked, Mark or Linda squirted her, then clicked her either after she came or after she became quiet. Fourth, we removed the leash entirely, so that Lili was completely off-leash. All the other procedures remained the same for this fourth and final training stage. 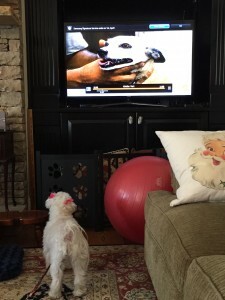 Soon Lili understood the rules and cooperatively and calmly modified her behavior, whereby Lili realized that barking was not a fortuitous behavioral option when observing an animal on television, but that coming to Linda as a replacement behavior was highly rewarding. In addition, to reduce Lili’s general energy level, which was likely part of the cause of Lili’s behavior, Mark recommended a program of proactive stimulation, where Linda would increase Lili’s exercise (running, ball), walks, and obedience training time. In summary, another CPT success story! If you don’t want your dog to bark at the TV or at other stimuli, please give CPT a call (404-236-2150).